Leading Manufacturer of zero point setter from Navi Mumbai. 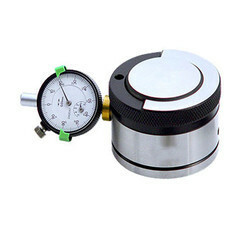 Useful for fast and easy locating of the reference point in axial direction of the machine spindle. when the setter is positioned on the workpiece and the tool is moved to the spring based probe surface till the zero position is reached, the distance between the tool tip to workpiece is 50mm.